The game times and network designation of 32 Southeastern Conference football games, including the first three weeks of the season, were announced during the news and information show SEC Now on SEC Network today, June 18. The network and time of two games scheduled for later in the season were also announced. In total, 32 games have been scheduled across ESPN, ESPN2, ESPNU and SEC Network. Additional selections will be determined as the season progresses. The season will open on Thursday, Sept. 3, with two non-conference matchups: the Belk College Kickoff Game in Charlotte, N.C. featuring North Carolina vs. South Carolina on ESPN at 6 p.m. ET, followed by Western Kentucky at Vanderbilt on SEC Network at 8 p.m. Within the first three weeks, every SEC football team will play on SEC Network. The national television network devoted to the Southeastern Conference kicks off its second football season with an expanded game day line-up. SEC Network will carry seven matchups the opening week, utilizing its SEC Network Alternate channel on Saturday, Sept. 5, to air an additional three games. In Weeks 2 and 3 the network will have a total of four matchups on Saturday, airing concurrent games in the 4 p.m. window on SEC Network and SEC Network Alternate. In total, SEC Network will air over 45 football games again this season with a noon, 4 p.m. or 7:30 p.m. kick most Saturdays following Week 3. 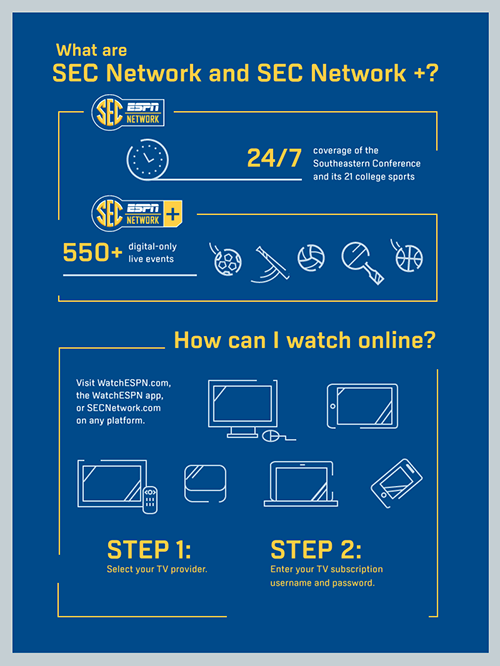 Its companion channel, SEC Network Alternate, will be used only on occasions when live games overlap. All SEC Network and SEC Network Alternate games are available on WatchESPN. In addition to the first 30 games, two games later in the season were announced as part of ESPN's College Football Primetime Thursday package: Auburn at Kentucky on Thursday, Oct. 15 at 7 p.m. and Mississippi State at Missouri on Thursday, Nov. 5 at 9 p.m.